Dr. Marie Lathers is Treuhaft Professor of French and Humanities at Case Western Reserve University. She is currently on a Fulbright Teaching and Research Award, teaching women's studies and African-American literature and film at the University of Dschang. Living in the village of Bafounda, in western Cameroon, Dr. Lathers has a unique perspective on Francophone Africa and what students who are wanting to explore French speaking Africa can expect. LTK: Can you talk a little bit about what languages are spoken in Cameroon? Dr. Lathers: French and English are the official languages, but there are dozens of indigenous languages in Cameroon. In general, all people speak the language of their "village" (or their parents' village if they did not grow up there), which is related to other local village languages. I live in the village of Bafounda in the Western Province. The native language is known as "Bafounda" but usually people just refer to it as the "patois" (French for a local language). LTK: What differences do you find between the French spoken in Cameroon and the French spoken elsewhere? Dr. Lathers: The French here is of course a bit different from that in France: a small example is that instead of saying "Comment ça va?" or "Comment tu vas?" (How are you?) when you great someone, you say simply "Comment?" (How?). I found this disconcerting at first, but now I'm used to it! LTK: Out of curiosity, what are you speaking in Cameroon most of the time? Have you learned any of the indigenous languages yet? Dr. Lathers: I speak English with my housekeeper and driver. They are from the English part of Cameroon. They speak Pidgin' to each other and I have picked up just a few expressions in that language. It is made from English but it is really incomprehensible to Americans. Instead of "I am eating," for example, they say "I chop." Instead of "Did you sleep well?" they say "you sleep fine?" "Tajo" means "see you later"
They have a wonderful way (which is common in this region of Africa) of putting both palms out and raised and making "hooohooo" sounds when they are pleased or amused. I've managed to imitate some of their gestures, to the point where people will ramble on with me in the language as if I can understand it! Dr. Lathers' daughter's classroom, the day after President Obama won the election. LTK: What would you say are some defining aspects of the culture there and how are they influenced by other European countries? Do you find anything that is distinctively "French?" 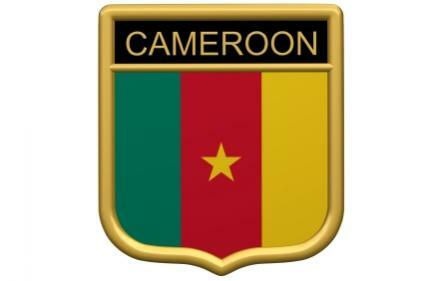 Dr. Lathers: Cameroon was originally a German colony but after WWI it was divided between the British and the French. Both parts have been influenced by their colonial governments in many ways (independence was in 1960), especially in terms of administration, including education. My daughter is in 5th grade in the village and the means of teaching are similar to those she encountered in 2nd grade in France: copying from the board, great emphasis on penmanship; use of multi-colored pens, etc. LTK: What would you say defines the culture as "Cameroonian"? Dr. Lathers: There are of course many aspects of the culture here that are blends of many other cultures: African cultures, French, British, etc. The way these blends work is what defines this culture as "Cameroonian." A love of nature, whether the dry mountainous areas of the north or the forested land by the sea. LTK: I know that you've been to Cameroon before, but were there any surprises this time? Dr. Lathers: I was here for 10 days in the summer of 2005 but I am now here for 10 months, and I am in my 6th month. There are lots of surprises, but nothing that I would call shocking. I knew that most people would be poor, but I was not prepared to see that the vast majority of villagers have dirt floors, and no electricity or running water. I was also surprised a bit that the schoolchildren in general cannot afford their schoolbooks, so most of their time is spent copying from the board. I have been very pleasantly surprised that the people are so friendly to me; my daughter and I feel very safe here, although sometimes the curiosity about our skin and hair can get tiring (especially if you are regularly surrounded by people trying to touch them--which only happened at the beginning at least!). LTK: For the student who is studying French--why might Cameroon make a good option for studying abroad? Dr. Lathers: Students would do well to choose Cameroon for study since it is a comparatively secure and stable African country. The people are very open and friendly and very willing to share their culture and their time. LTK: And would you say that there are careers to explore in Cameroon for the person who is interested in working in a Francophone country? Dr. Lathers: There are many NGOs working in Cameroon and students can certainly think about a future career in helping people here acquire potable water, sanitary needs, and electricity. The Peace Corps has a lot of people in Cameroon, for example. Getting honored by the village chief. LTK: What do you think you'll most bring back to the states with you when your visit is over? Dr. Lathers: That's a tough question: I'll bring back so much! Many memories of good friends and good times. Also a real resilience, for I have learned here that if you don't have water or electricity (ours are often cut) then you can still make do. My daughter has learned that we purchase too much junk in the States; toys can be made of the simplest things--as the children here make them--and almost everything can be recycled or reused! I'll also bring back with me a love for the beautiful countryside here. Finally, a great respect for the university students who with very little means manage to learn about western cultures. The problem of getting books here is huge, and so students generally learn with no textbooks and perhaps a few photocopies. Given the great obstacles that they have to overcome, we really have no excuse not to learn about African cultures!